A fresh report by Yesmail shed some light on just how powerful a responsive email can be compared to a desktop-centric one. The dataset is fresh as it can be: the study used millions of emails from 2015 sent out by Yesmail users. 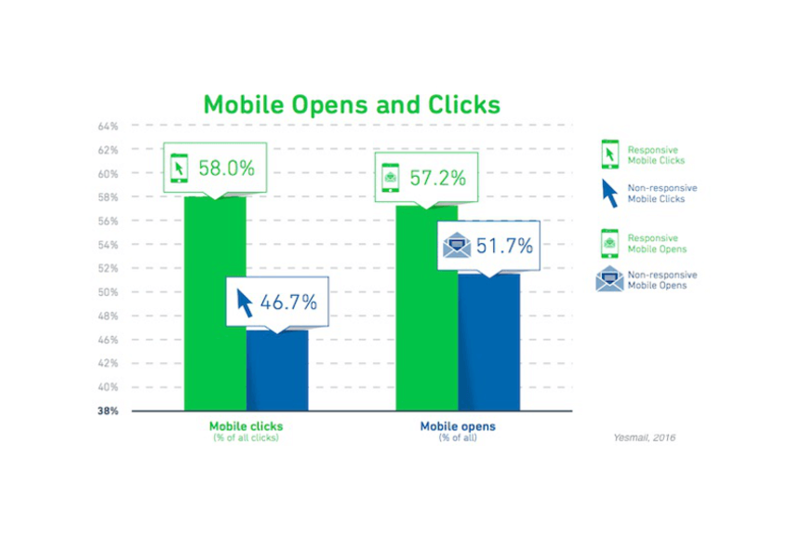 One of the key findings is that more than half of opens took place on mobile devices for all brands, either they were using responsive email templates or not. It is also apparent – and not at all surprising – that mobile users clicked less when they were presented non-responsive emails. For those not using responsive mobile clicks accounted for 46.7%, companies sending only responsive emails however reached 58%. 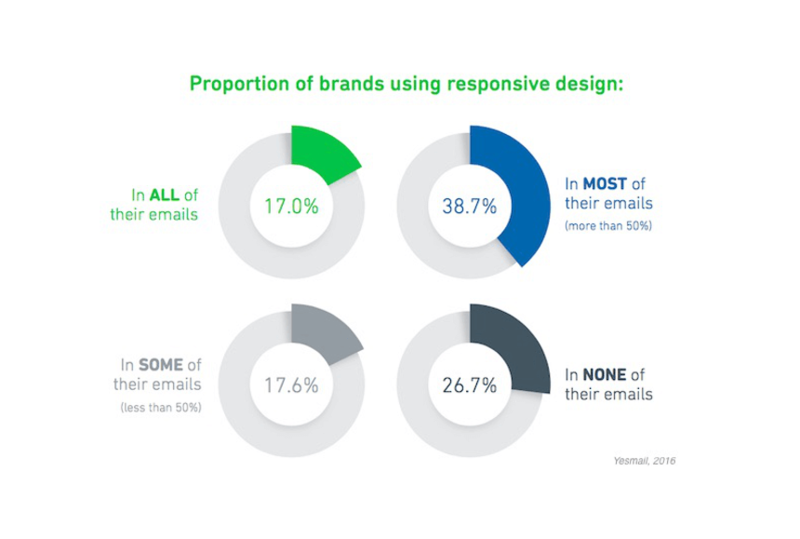 Still, only 17% of brand use responsive design for all their emails, while 17.6% uses responsive for some emails and 26.7% don’t use it at all. The findings strengthen the obvious conclusion drawn from years of other research: when users of smart devices receive email which is responsive, they are much more likely to click through. In 2014 MailChimp measured a 15% increase in CTR among mobile users when using responsive design. It makes sense as a responsive email is displayed properly on all devices: CTAs are not hidden, copy remains readable, all of your content will be easy to consume. More clicks mean that you get more leads who you can convert on your landing or product pages – and that is a metric that can clearly show that responsive email templates have higher ROI than classic desktop centered designs! It also doesn’t require a great investment: today email marketing is much simpler than it was a few years ago. Online drag-and-drop email builder software with intuitive interface – like EDMdesigner – is available for anyone and it requires very little investment compared to the results. If you have a list of at least a few hundred subscribers the money you spend on responsive emails will have a higher return than most things in your toolbox. In this post you'll learn how to send emails from the Linux command line. I'll show the most often used commands, SMTP configuration and terminal options. Responsive email coding is complex. Are you native in React Native? Abstract away email HTML & CSS into components with react-html-email or mjml frameworks.